BOSTON Two goals. Seventeen seconds apart. A second Stanley Cup victory in four seasons for the Chicago Blackhawks. Seventy-six seconds away from defeat and a trip home for a decisive seventh game, Bryan Bickell tied it. Then, while the Bruins were settling in for another overtime in a series that has already had its share, Dave Bolland scored to give Chicago a 3-2 victory in Game 6 of the Stanley Cup Finals on Monday night. The back-to-back scores in about the time it takes for one good rush down the ice turned a near-certain loss into a championship clincher, stunning the Boston players and their fans and starting the celebration on the Blackhawks' bench with 59 seconds to play. "We thought we were going home for Game 7. You still think you're going to overtime and you're going to try to win it there. Then Bolly scores a huge goal 17 seconds later," said Chicago forward Patrick Kane, who won the Conn Smythe Trophy as the postseason's most valuable player. "It feels like the last 58 seconds were an eternity." 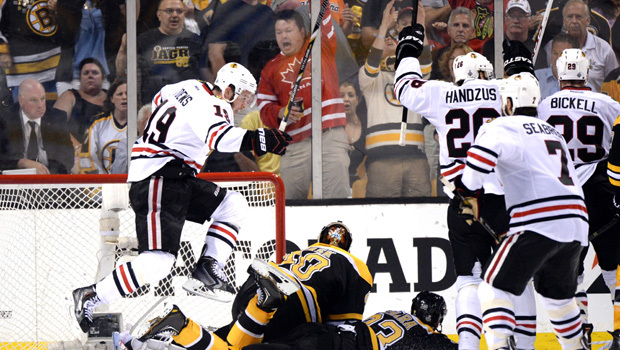 CBSSports.com's Adam Gretz says the Blackhawks showed the heart of a champion. "It wasn't their best perfomance of the playoffs, and they had to sustain a huge push from the Bruins in the first period," Gretz writes, "but in games like this you just have to throw style points out the window. The Blackhawks did what a champion is supposed to do and found a way to get it done when it mattered most." The team that set an NHL record with a 24-game unbeaten streak to start the lockout-shortened season won three straight games after falling behind 2-1 in the best-of-seven finals, rallying from a deficit in the series and in its finale. Corey Crawford made 23 saves, and Jonathan Toews returned from injury to add a goal and an assist in the first finals between Original Six teams since 1979. "I still can't believe that finish. Oh my God, we never quit," Crawford said. "I never lost confidence. No one in our room ever did." Trailing 2-1, Crawford went off for an extra skater and the Blackhawks converted when Toews fed it in front and Bickell scored from the edge of the crease to tie the score. Perhaps the Bruins expected it to go to overtime, as three of the first four games in the series did. They sure seemed to be caught off-guard on the ensuing faceoff. Chicago skated into the zone, sent a shot on net and, after it deflected off Michael Frolik and the post, it went right to Bolland, who put it in the net. The Blackhawks on the ice gathered in the corner, while those on the bench began jumping up and down. It was only a minute later, when Boston's Tuukka Rask was off for an extra man, that Chicago withstood the Bruins' final push and swarmed over the boards, throwing their sticks and gloves across the ice. "It's unbelievable, man," Crawford said. "So much hard work to get to this point. Great effort by everyone on the team." The Bruins got 28 saves from Rask, who was hoping to contribute to an NHL title after serving as Tim Thomas' backup when Boston won it all two years ago. "It's obviously shocking when you think you have everything under control," Rask said quietly, standing at his locker with a blue baseball cap on backward and a towel draped over his shoulders. The sold-out TD Garden had begun chanting "We want the Cup!" after Milan Lucic's goal put the Bruins up 2-1 with eight minutes left, but it fell silent after its team coughed up the lead. The team came out to salute its fans as they streamed out of the building for the last time, from the air conditioning into the summer air. "Probably toughest for sure, when you know you're a little bit over a minute left and you feel that you've got a chance to get to a Game 7," Bruins coach Claude Julien said. "And then those two goals go in quickly." The arena was almost empty -- except for a few hundred fans in red Blackhawks sweaters who filtered down to the front rows -- when NHL commissioner Gary Bettman handed the 35-pound Cup to Toews, who left Game 5 with an undisclosed injury and wasn't confirmed for the lineup until the morning skate. The Chicago captain skated the Cup right over the crease in which the Blackhawks mounted the comeback and in front of the fans in Blackhawks sweaters who lined the front row behind the net. Toews banged on the glass while the remaining Bruins fans headed up the runways. He then continued the tradition of handing it from player to player before the team settled to the side of the faceoff circle for a picture with the trophy they will possess for the next 12 months. Just like in 2010, they won it in a Game 6 on the road. "In 2010, we didn't really know what we were doing. We just, we played great hockey and we were kind of oblivious to how good we were playing," said Toews, who scored his third goal of the playoffs to tie it 1-1 in the second period, then fed Bickell for the score that tied it with 76 seconds to play. "This time around, we know definitely how much work it takes and how much sacrifice it takes to get back here and this is an unbelievable group," Toews said. "We've been through a lot together this year and this is a sweet way to finish it off." The Blackhawks opened the season on a 21-0-3 streak and coasted to the Presidents' Trophy that goes to the team with the best regular-season record. But regular-season excellence has not translated into playoff success: Chicago is the first team with the best record to win the Cup since the 2008 Detroit Red Wings. The Blackhawks went through Minnesota in five games and Detroit in seven, rallying in the Western Conference semifinals from a 3-1 deficit and winning Game 7 in overtime. They got through the defending NHL champion Los Angeles Kings in five games to return to the Cup finals, where Boston was waiting. Chicago won the first game at home in three overtimes but dropped Game 2 -- another overtime -- and fell behind 2-1 in the series when it returned to Boston. After that, it was all Blackhawks. The tightly contested finals -- with three games going a total of five overtimes -- may help fans forget the lockout that shortened the season to 48 games and pushed back the opener to Jan. 19. That left the teams still playing ice hockey on a 95-degree day in Boston on June 24, matching the latest date in NHL history. Fans in their Bruins sweaters filtered into the TD Garden to see the last game in Boston for the season with the hope there would be one more in Chicago: a seventh game just like two years ago, when the Bruins rallied from a 3-2 deficit, then won in Vancouver for their first NHL championship since 1972. Both teams were bolstered by the return of star forwards, Selke Trophy winner Toews of Chicago and Patrice Bergeron, who was a finalist for the award given to the top defensive forward in the league. Both returned after missing the end of Game 5, but only Toews showed up in the box score. Bergeron said afterward that he had a broken rib, torn cartilage in muscles, and added to that a separated shoulder on Monday night. "It's the Stanley Cup Final. Everyone is banged up," Bergeron said. "It's tough to put words to describe how we're feeling right now. You work so hard just to get to this point and give yourself a chance to get the Cup. You feel like you're right there and you have a chance to force a Game 7, and definitely it hurts."